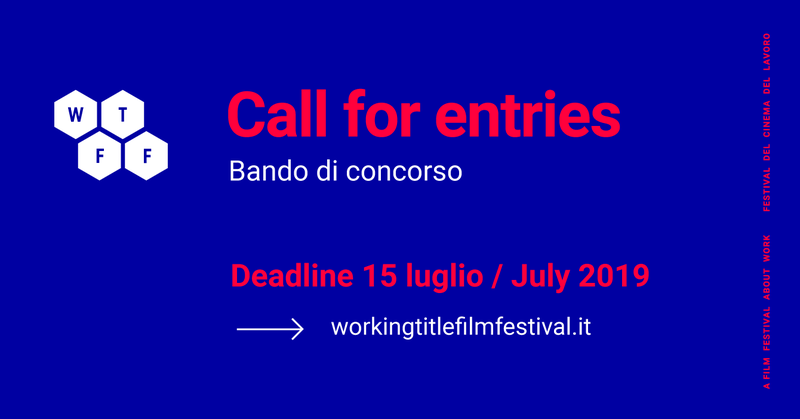 The Working Title Film Festival is promoted by the organization LIES – Laboratorio dell'inchiesta economica e sociale (a permanent workshop for an economic and social survey), based in Padua and which has been active in Padua and Vicenza since 2011. The venues hosting the 4th edition will be Sala Lampertico (Cinema Odeon), Exworks (Zerogloss), an artistic and creative space, and the local wine shop Bottega Faustino. The aim of the Festival is to encourage, through cinema and audiovisual arts and expressions, a reflection on the issues related to Work, especially in the contemporary society, and on the relevant political and social context. The Working Title Film Festival intends to read through a contemporary viewpoint the current patterns and conditions of the world of work, focusing not only on its negative perspective, on precariousness, fragmentation and reduced workers’ protection and rights, but also on its creative possibilities. Moreover, the festival aims at giving visibility to audiovisual artworks that are not mainstream and do not belong to the official distribution network, and to the emerging cinema, thus creating a dialogue between independent filmmakers and the audience. The Working Title Film Festival 4 will include a selection of audiovisual works in competition and Q&A, book presentations, and a special meeting involving producers and directors with audiovisual projects in development on the theme of work. The international competition is open to any genre of audiovisual work on the theme of work, in all its forms. The work can be articulated in the past, present or future tense. The presented topics can vary, they may be someone's life story or testimonies of current or disappearing jobs, the latest technological and social frontiers, precariousness and the lack of rights, rewarding stories, as well as success stories related to talent and creativity, both intellectual and manual. Open to experimental short-films, video art films, video clips on the theme of Work, with a maximum length of 15 minutes, completed after the 1st of January 2017. For both sections, the festival will also accept audiovisual works that have already been screened before. All the Italian-spoken films are required to have English subtitles, and all the films that are not in Italian are required to have Italian and/or English subtitles. The submission to the festival requires the payment of a fee of 10 € for each section. - copy of the receipt of the bank transfer. “Work in progress” is a meeting of producers and directors presenting audiovisual projects in development on the theme of work. Open to both Italian and non-Italian directors who wish to present their audiovisual projects in progress, of any film genre and with any duration, on the theme of work. The meetings will be held either in Italian or in English, depending on the applicant's choice. The meeting will be held at Exworks (Zerogloss) during the afternoon of 5th October 2019. The aim of the meeting is to create potential new synergies between filmmakers and producers. Moreover, the producers will make available their expertise to the directors, providing feedback on their projects. To take part in the selection for “Work in Progress” the directors need to fill in the attached form (including logline, short synopsis, script, director's statement, visual references, max 5-minute teaser, as well as a biography-filmography). The festival selection committee is responsible for the selection of the films and of the audiovisual projects. The festival selection committee will inform the applicants about the selected shortlist no later than the 30th July 2019. A back-up copy for each in .mov or .mp4 is also required. The Festival will cover half of the transport cost for the hardcopies of the selected films. The copies will be returned within 2 weeks after the end of the festival. The participants agree that the Festival is authorised to use photographs and excerpts of their film (for a maximum of 3 minutes) for release to the media (press, TV, radio) and on the internet, exclusively for promotional purposes. Screening and music copyright shall fall under the author's responsibility. Whoever submits the work is responsible for the royalties of the submitted work. The festival will not cover any rental fees for the selected films. Registration to the festival implies the authorisation to the screening of the work during the event. For any further possible use, the author will be contacted by the organisers. The Festival will nominate a jury, consisting of at least three members, professionals who belong to the Italian and European film or however cultural industry. This Jury will award the prize for best film in each section and may decide to assign one or more honorable mentions. There is no prize money. Completion of the registration form will indicate the applicant's consent to the above mentioned rules and regulations. The Festival reserves the right to make decisions on matters not specified herein. Any legal disputes shall fall under the jurisdiction of the Vicenza court.